Custom models of AMD’s recently launched Radeon R9 290X and Radeon R9 290 have been highly anticipated by consumers and it seems like the wait will finally be over in a month’s time. Expected in mid-January, AMD will give the green light to its board partners who will unleash their latest non-reference based solutions which will offer improved cooling and graphics performance out of AMD’s flagship Hawaii chip. Launch of the custom boards are expected on 17th January 2014. Several custom Radeon R9 290X graphic cards are going to launch from AICs such as ASUS, HIS, MSI, Sapphire, XFX, Gigabyte and a few more but we will just be focusing on two cards at the moment that have actually been listed. Prices vary for both models since they are being sold by different retailers but we should expect a similar price point once they go on sale in mid-January 2014. First up is the ASUS Radeon R9 290X DirectCU II which is an overclocked edition card and was detailed just yesterday, it ships with a factory overclock out of box. From a technical perspective, we are looking at the default 2816 Stream processors, 176 Texture mapping units, 64 Render Backends and a 4 GB GDDR5 memory operating across a 512-bit interface. The clocks have been configured at 1050 MHz for the core and the memory runs at 1350 MHz (5.4 GHz effective) which is upped from its default state of 1000 MHz core and 1250 MHz (5.0 GHz effective) clock speeds. The PCB is custom made and features ASUS’s Super Alloy Power technology with a robust 8-Phase DIGI+ VRM power delivery which gives the core enough power to overclock and run with maximum stability. The back of the PCB comes with specialized SAP CAPs which increase the overclocking headroom while the custom concrete alloy chokes help reduce the buzzing noise produced on reference variants. Juice is provided through an 8+6 Pin power configuration. The PCB is specifically designed for ASUS ROG enthusiasts hence has voltage read points at the back which are visible through the backplate. Coming to the cooling solution, ASUS has featured their flagship DirectCU II solution of the card which is a dual slot cooler equipped with cooltech fan technology that helps push an increased volume of air to the internal heatsink chamber with direct contact surface dissipating heat with the help of four 6mm and a single 8mm heatpipe. Display outputs include Dual-Link DVI, HDMI and a display port. 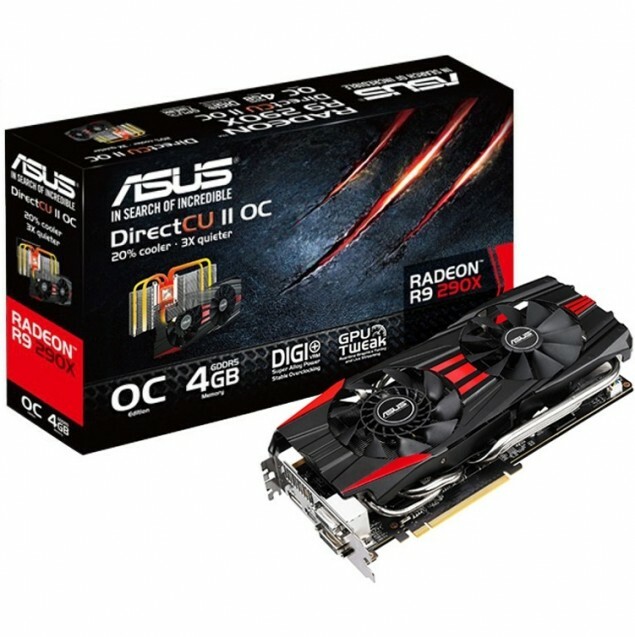 The card has been listed by retailer Overclockers.Co.UK for £499.99 which is a decent price for a custom board with huge overclocking potential. 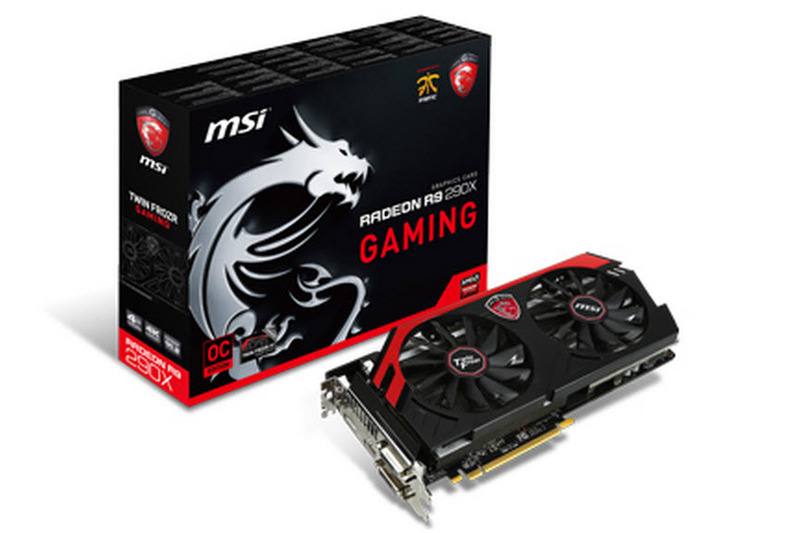 MSI is preparing several variants of the Radeon R9 290X which include the Twin Frozr IV, Twin Frozr 4S OC and their flagship AMD Lightning variant which is also expected to hit retail in January 2014. MSI’s Radeon R9 290X Twin Frozr OC falls in their Gaming lineup which was recently introduced and is aimed primarily towards gamers and enthusiasts. The GPU features 2816 Stream processors, 64 ROPs, 4 GB GDDR5 memory and a 512-Bit Bus along with a 1050 MHz on core and 5400 MHz memory. Power would be fed through an 8+6 Pin connector configuration and the card would be able to support upto 4-Way Multi-GPU functionality. Display outputs will include the regular Dual-Link DVI, HDMI and a display port. As for the PCB, we are looking at a non-reference design featuring MSI’s top of the line Military Class IV features and components so overclocking won’t be a hassle on this red machine. For cooling, MSI tops up the PCB with a Twin Frozr 4S cooler that’s larger than the current Twin Frozr 4 cooler featuring a support bracket, backplate and two 100mm fans with propeller blade design pushing air towards a large aluminum fin array block. Additionally, some tech sites have already received custom boards for review purposes. Guru3D have posted a teaser shot of the ASUS Radeon R9 290X DirectCU II along with its stock performance in 3DMark Firestrike. 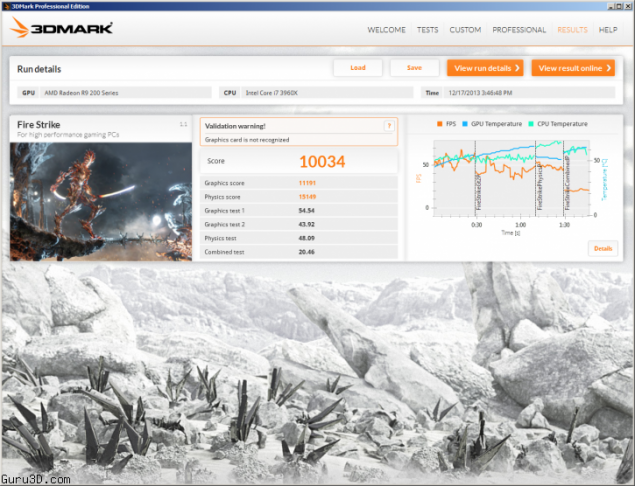 The card scores 10034 points in performance mode which is a good increase over the 9600 Marks scored by the reference variants.